A vehicle rollover is a dangerous accident, as an August Rollover Crash on the Florida Turnpike demonstrated. The vehicle, a sport utility vehicle blew a front tire while traveling northbound, overturned in the median and then rolled over into the southbound lane. Four of the occupants were ejected, none of whom were wearing seatbelts. One occupant was killed and the Florida Turnpike was closed for more than three hours, leading to an eight-mile backup, according to the Florida Highway Patrol. This fatal crash is typical of a rollover. A vehicle can lose stability, roll multiple times and possibly eject some of the occupants, which can result in their deaths. Safercar.gov reports rollover crashes make up more than one-third of all fatal passenger vehicle crashes. More than 7,000 people died in rollover crashes in 2010 and almost 70 percent failed to wear seat belts. Rollover crashes were first highlighted with the Ford Explorer-Firestone tire issue of the 1990s. The narrow stance and high center of gravity of the Explorer made it prone to rollovers and this was exaggerated by the behavior of the Firestone tires it was equipped with. 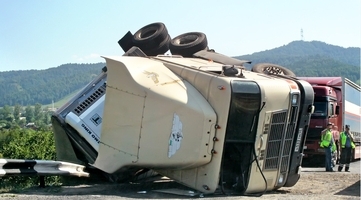 Many rollovers occur when the tires begin to slide on the road surface and then hit a curb or other raised obstruction, which triggers the rollover as the vehicle tips. This can occur due to defective tires or poorly maintained tires, road surface condition and driving too fast. Fatal rollover crashes are often speed-related. According to National Highway Traffic Safety Administration, 40 percent of fatal rollovers involved speeding, and more than three-quarters occur on high-speed roads, where the speed limit was 55 mph. Source: TCPalm.com, “Rollover accident kills 1, closes turnpike for hours near Yeehaw Junction,” Jonathan Simmons, Aug. 6, 2012. Injured due to Rollover Crash on the Florida? You need a primary car accident lawyer to fight for your right. Call us at 561-395-8055 for a FREE consultation.